I'm supposed to write something impressive about myself in the 3rd person, as if some authority figure is actually writing my biography, while fooling you into thinking it was written by such an authority figure. I'll spare you the charade. Here's my short biography, written by myself. Currently, I'm the founder and administrator of TheFastlaneForum.com — a worldwide discussion forum dedicated to the advancement of Fastlane Entrepreneurship and the philosophy behind it. With over 130,000 visitors a month, The Fastlane Forum is one of the web's leading destinations for startup entrepreneur discussions simply because of what it stands for— and for what it doesn't—you won't find your typical cattle-call nonsense you find at most forums (MLM and affiliate marketing discussions are prohibited) just real entrepreneurs who share a common bond for entrepreneurship driven by value. In addition to the forum, I also own a small publishing company that is dedicated to the manufacture, distribution, and promotion of my book in all forms; print, eBook, and audiobook, including international licensing. As for storied beginnings, my entrepreneurial roots started young with several various failed ventures, from fitness supplements to automotive audio. One of my interests was the limousine business which I thought "hey, that would be such a cool business to own!" (Wow, talk about a flawed premise!) So, in my 20's, I took a job with a small company with the hopes of "learning the ropes". After a few years in this business, I soon learned it was NOT the type of company I wanted to own based on Fastlane principles. However, my operational experience had a great benefit: It opened my eyes to a poorly met need in the industry which would later become Limos.com, a global ground transportation aggregator which I founded in 1997 with no money, and no internet training. As for that great domain, I didn't buy it at Register.com for $15 — I had to buy it from a private party in the secondary market at the height of the dot-com craze, all financed by my credit cards. I was such the risk-taker back then. After running this business for several years with over 40 months of consecutive profitability, I was fortunate enough to get caught-up in the dot-com craziness and sold the company for a nice "life-changing" amount of money. Unfortunately, the overflowing flutes of champagne didn't last long. That company later went bankrupt (as did most of the companies back then) at which time I was forced with a decision: Watch the company fold or buy it back and reclaim my title as CEO and Founder, at which point I would need to earn my keep in a world when everyone was failing. 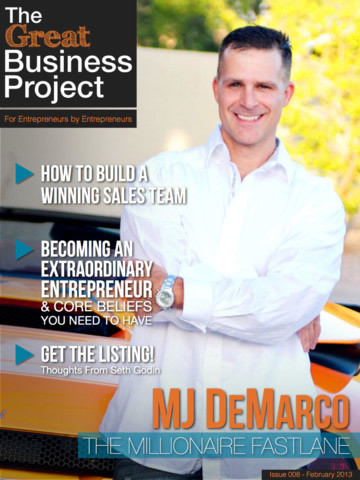 Over the next 6 years, I continued to build the business into one of the preeminent leaders in the space, one which routinely profited 6-figures monthly while I worked whenever, and wherever I wanted. In late 2007, I sold the company (again) to a Phoenix based private-equity company for a multi-million dollar cash offer, successfully exited the business landing into a nice cushy semi-retirement, my personal eternal bliss of "do what I love", which is writing. The take-away in my story is this: I created a multimillion dollar company despite lacking two common themes most people use as excuses: Money and education. 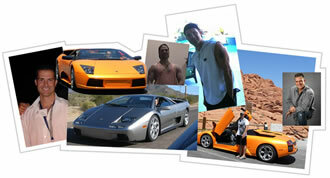 I built my company with $900 and no formal schooling on web technology. I self-funded and self-taught myself everything, powered by discipline and educated from widely available resources, most of which, were free, and still are. After the sale, I took a few years off and focused on writing which is how The Millionaire Fastlane (TMF) was born— not just because I love to write, because it needed to be written. TMF was released in late 2011 with little fanfare. No phony hyped-up launches from circle-jerking friends. No upsells into some high-priced coaching gigs. No faux testimonials from "thought-leaders" who never read the book but just happen to share the same publishing imprint. Yes, TMF was just a labor of love, something I wish I had read back when I was 20 years old. A few years later and TMF has gone on to become an international best-seller, translated in multiple languages, and is frequently compared against some of the timeless classics like Think and Grow Rich and Rich Dad Poor Dad. Today I live in beautiful Phoenix Arizona where I am working on my next book [Untitled] which I hope to have released in 2014. Can You Handle 9 Hours With Me? 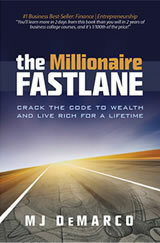 I've written The Millionaire Fastlane as if we're sharing coffee in a neighborhood cafe. If you read at average speeds, my book should take you 9 hours to read. Yup, 9 hours Ms. Bueller. So that means, if you're going to be hanging out with me for 9 hours, you should have a sense of who I am, and IF (and that's a big IF) we'd get along. If you're sporting a LA Laker's tattoo on your face, chances are we aren't going to get along, and NO, not because of the tattoo, but because you're a moron. Old enough to be outside of a marketer's favorite demographic. Dark brown and yes, I still have all of it. Ambidextrous:Write/bowl left-handed, throw/bat/golf right handed. I don't watch much TV— Seinfeld reruns. Trek - love how they keep it close to real physics. Leave me the f*ck alone. Figure that out. I was a hip-hop dancer loooooong time ago. My dancing escapades once ventured into the risque. Critical thinking: I am represented by no religion and no political party. ATVs in the desert, writing, working out. Health insurance companies— all of them can go to hell.